The Tribune Review reported that Port Authority of Alleghany County (Pennsylvania) responded to a disturbance on Port Authority Property involving a father and a son. Bruce Kelley Jr. confronted and fought one of the responding officers. A foot pursuit ensued where officers attempted to stop the suspect with a stun gun but were unable to do so. Port Authority officer Brian O’Malley joined the pursuit with K9 Aren, a 4 year veteran in patrol and explosive details. In the pursuit, Aren suffered multiple stab wounds and was rushed to a local animal hospital, but died after being transported. Officers fired at the suspect and he was pronounced dead at the scene of the incident east of downtown Pittsburgh. Aren is the eighth K9 officer killed since the beginning of 2016, with an average of two police dogs dying every week in January. 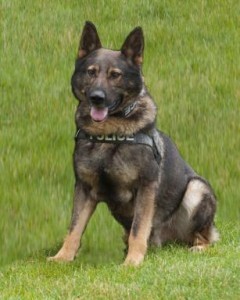 Aren’s handler, O’Malley, worked with him for the past four years in the Port Authority’s explosive detection K9 unit.